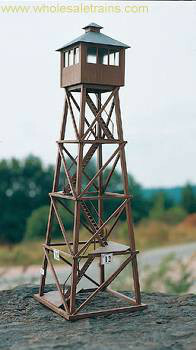 I'm presently refurbishing my built Piko forest watch tower. Given it a good clean with Isopropyl alcohol, fixed all those debonded struts and the odd damaged bits, given it a priming and a new colour coat of Halfords Rover Maple (an almost exact match to the original brown). Will give it a finishing coat of Halfords clear matt enamel. 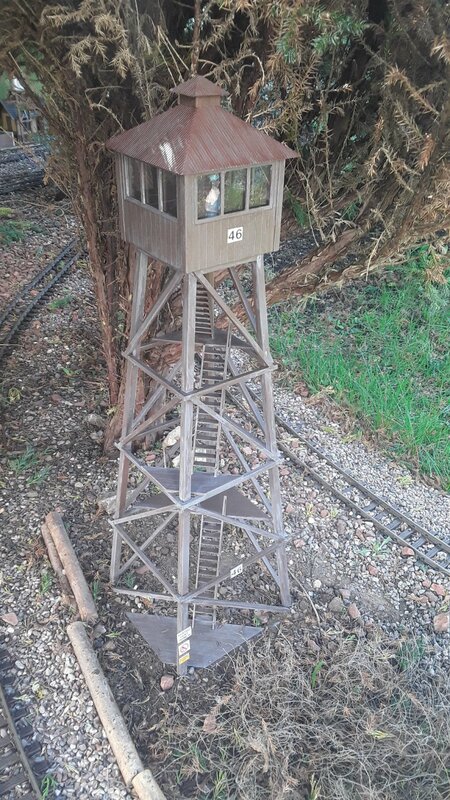 My question is this - how do I replicate the original "weathered" wash finish, to fill in the "woodgrain", of the original ? I have never used, applied or made up a colour wash finish in all my years of modelling. Why ? I like my stuff "fresh out the works" in appearance normally but I realise this will not do in this instance. Any ideas ? Thanks Rio, I very much admire the work you post here. However, the model has a moulded in "woodgrain" so it only needs to be "filled", no need to create the grain (done bit of scumbling in my time on 16 mm coaches) so scraping and/or dry brushing would not be the techniques I would think of. Fortunately I find that moulded woodgrain is the easiest surface to weather; it's large smooth surfaces that are a headache. As Paul says, just wash it down with dilute matt acrylics - greys, browns, a bit of white - then wipe it off to taste. Old wood generally tends towards silver grey. For your situation Max, I would use isopropyl with some acrylic or powder paint (pigment) mixed in to give a consistency of thin milky cream and just wash over the whole item using a brush to make the colour pigment sink in to the grain but also not to clump or blob. It will dry pretty quick so, as it does, you can wipe it with paper towel or a dry brush to take any extra off and to get a good effect. Once dry spray the whole lot with a good matt varnish like Testors Dulcote or Vallejo Matt. The varnish will also dull back the amount of colour showing. Anbody come across this product. Bought about 30 years ago, in the UK. I've never had a use for it till now. Note the price, even then, in $'s. Looks good Max... Rustall is a good product but I hope that an 'old' sample still works....should do. 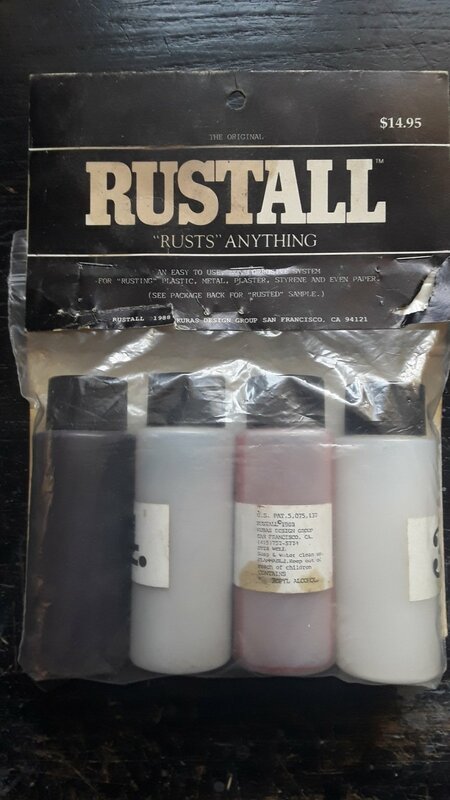 Rustall is a good product but I hope that an 'old' sample still works. That`ll do nicely Max,good job! ,,,,,,,,wasn`t so hard to do it in the end was it?